Amanda Bastien is a Worcester-born multi-media artist and a Visual Arts teacher at Auburn High School. She graduated with a BFA from Montserrat College of Art and an MAT from Salem State College. She has exhibited in a variety of small group shows hosted by affiliations such as ARTSalem and The Spirit Gallery in New London, CT.
Amanda’s artwork ranges from formalistic reconstructions of natural subjects, to visual interpretations of life experiences, to crafts such as ornaments and printed cards. 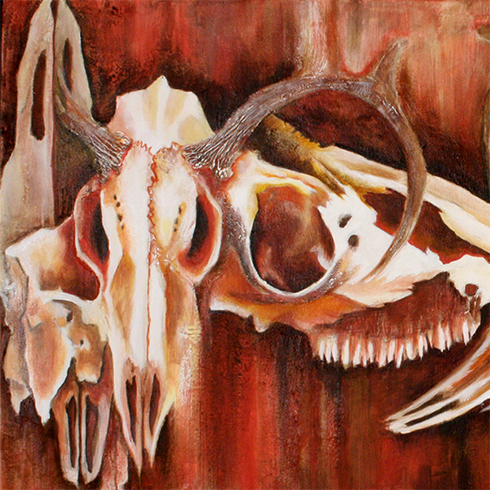 Her longest running series of paintings, Bones, began with 20+ years of collecting natural objects such as bones, bugs, and flowers. They are reminders of journeys taken and of the world she experiences. Often the objects were gifts from friends and family who were kind enough to pause and collect tokens for her. It is in this way that the paths of many are woven into the collection, and subsequently into the artwork.